ID of different polymorphic forms (“fingerprints” ). Knowledge about crystallinity is highly relevant, as a crystalline form is usually preferred in development: In contrast to amorphous material, a crystal has well-defined properties (melting point, solubility and IDR) – parameters that should be known in order to control your final product. The XRD method is described in Ph. Eur 2.9.33. The result from an XRD analysis is a diffractogram showing the intensity as a function of the diffraction angles. Positive ID of a material using XRD analysis is based on accordance between the diffraction angles of a reference material and the sample in question. 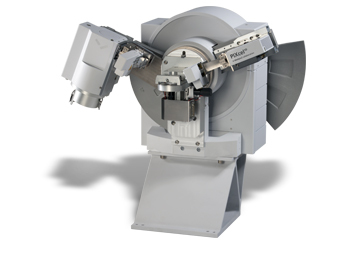 XRD analysis is based on constructive interference of monochromatic X-rays and a crystalline sample: The X-rays are generated by a cathode ray tube, filtered to produce monochromatic radiation, collimated to concentrate, and directed toward the sample. The interaction of the incident rays with the sample produces constructive interference (and a diffracted ray) when conditions satisfy Bragg’s Law (nλ=2d sin θ). This law relates the wavelength of electromagnetic radiation to the diffraction angle and the lattice spacing in a crystalline sample. The characteristic x-ray diffraction pattern generated in a typical XRD analysis provides a unique “fingerprint” of the crystals present in the sample. When properly interpreted, by comparison with standard reference patterns and measurements, this fingerprint allows identification of the crystalline form.